"Do you think maybe age-uke is just Goju's hiki-uke done higher than normally seen? I find myself performing it more like hiki-uke most of the time and it works fine, and since age-uke is notably absent from every koryu Goju kata, it makes me wonder what is being said by it's presence in the first kata usually taught." 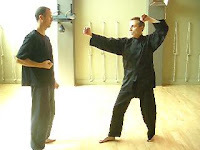 Age uke is a basic rendering of haiwan nagashi uke - the block one sees with the simultaneous upper block and punch as is found in long fist, taiji, bagua, xingyi etc. The key difference between this block and the age uke is that the body turns (at least to some extent) to let the attacker's momentum be deflected sideways, not just directly up. This is the case even with pao quan from xingyi (where the "simultaneous" punch is performed as a reverse punch, not a leading one, but the body is still angled as you block/strike). 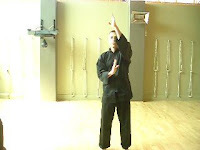 Hiki uke (an open-handed hooking chest level block that deflects sideways) also occurs in long fist, taiji, bagua, xingyi etc. In the Chinese arts it really is a separate technique, especially when practised as a basic. The main difference in its mechanics arises, as Zach points out, from the height at which you apply it. You could apply a high hiki uke, but you'll probably find yourself blending it into a haiwan nagashi uke - ie. you'll roll your forearm and turn your body as you deflect it sideways. 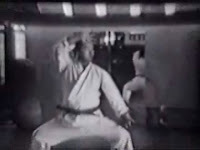 I think age uke was used in the first goju kata as part of the drive to create "uniform" karate by Miyagi and Nagamine. Goju's rising block was probably the haiwan nagashi uke as found in the kata seiyunchin where you have a a high block near the head and a low block (instead of a punch) in shiko. It seems to me that the reason why you might blend age and hike uke is that at a certain position your body mechanics start to merge: the hiki uke applied at head height with a slight sideways turn of your body becomes a haiwan nagashi uke (which, as I've said, is a more complex form of age uke)! In my view the blocks are meant to "blend" into one another; the basics we use are, I believe, just points frozen along a continuum. The other "age uke" in goju is the steeple block as found in seisan, kururunfa etc. I see the steeple block as just the first (intercepting) portion of the haiwan nagashi uke - stopped before the forearm rolls over. In goju ryu I believe the role occupied by age uke as a basic is taken up by mawashi uke because mawashi uke contains a "steeple" block. Mawashi uke is quite ubiquitous in goju, where hawian nagashi uke only occurs in seiyunchin from memory (I also use it in naihanchi, but this is not common). 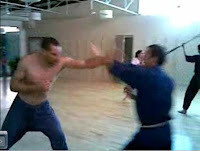 I acknowledge that my theory about mawashi uke is controversial (and is a separate issue - see my article "Is mawashi uke goju's rising block? ").